It's a little known fact that the National Party Decorators Association (N.P.D.A) has voted crepe paper the party decoration of the century for its consistent use over the past 100 years. Bartz's is proud to keep this tradition alive by maintaining the widest color selection available! 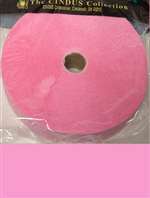 We are also happy to offer the highest quality crepe paper streamer on the market. This steamer measures 1.75" wide x 500' long (4.4cm X 152.4m) per roll. If you have a larger room, or are just doing a lot more decorating this is the roll for you. Each streamer is bleed, fade and flame resistant.